Yeah, sometimes breakfast catering, especially in Houston, can be challenging. Houston is full of culture and diversity, which means finding the right food for everyone. Finding the right food that everyone will like gets frustrating. But with Shipley Do-Nuts, you really can’t go wrong. there’s plenty of options that we provide for everyone to enjoy. Ah, yes. Who doesn’t like to take a bite out of a sweet donut in the morning? It can be a treat for just getting up in the morning. The great thing about donuts is there are multiple selections to choose from. Whether you want the original glazed donut, cream and jelly filled, or fun and decorative donuts, we can get what you need. If you need a certain decoration for your donuts, feel free to ask! Whether you need a smiling face or hearts, we can make it happen! Sometimes, there’s too much food to try in big servings. Hey, that’s okay. Not many people complain about too much food. If you want a wide selection to choose from, go with our donut holes and kolache poppers. These work great for single servings and let your guests try many different flavors. They also allow smaller portions for those who want to just sample the food. Houston breakfast isn’t really breakfast without kolaches! Kolaches are a regional food and are big in Houston. If you have people at your event coming from out of town, give them a taste of real Texas food. We have a wide variety of kolaches to choose from. Whether you want sausage and cheese or cheese and jalapeno, we can make it happen. Let your guests have a taste of Houston breakfast. We know breakfast catering can be difficult. Although it’s a difficult task, we know it’s important to try and please as many people as possible. Our wide selection gives something for everyone to enjoy. You can also add a fruit tray to your order to make sure everyone enjoys themselves at breakfast. Breakfast is the most important meal of the day, which means making sure everyone has something to eat. Please don’t forget the coffee! Coffee is standard fare, so give them a rich and delicious coffee that pairs perfectly with donuts and kolaches. We know it’s hard to function without having your morning coffee. Let us fuel and charge you for the day. Donuts and kolaches don’t go bad in an hour or two. This allows you to give them something to snack on throughout the day. As mentioned above, there’s nothing wrong with too much food. Enjoy yourself throughout the day. Surprise everyone with Shipley Do-Nuts. 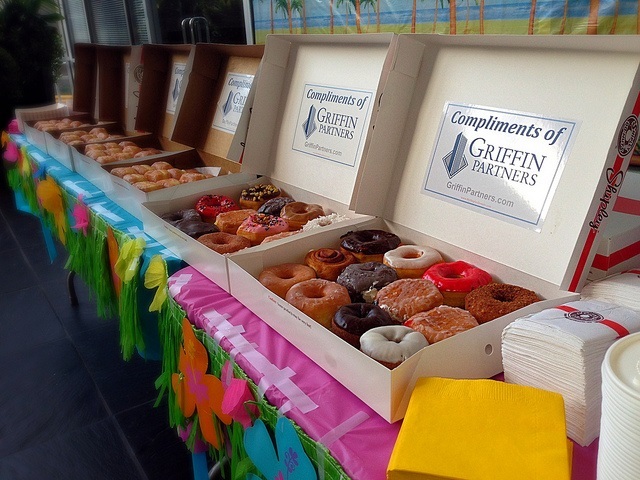 Established since 1936, we bring the fun to breakfast catering. Call us now at (713) 589-3292 or order online for your next catering event. Get the perfect snack to feed you and your guests today!